The team at Rockweiler Insulation is thrilled to announce Aaron Calvert received the ExCEEd on the Job Installer of the Year Award at the Owens Corning™ Certified Energy Expert® (CEE) National Meeting held in May in Scottsdale, Arizona. 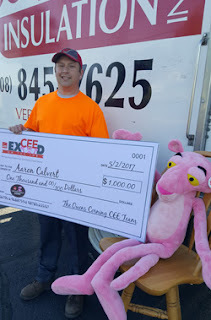 The ExCEEd on the Job award recognizes insulation installers who go above and beyond to ensure excellence with each project. As a recipient of a quarterly ExCEEd award, Aaron was eligible for this first-ever national award. This recognition is one example of Rockweiler Insulation’s exceptional leadership. With support from the Owens Corning™ Certified Energy Expert® program, Rockweiler Insulation continually trains its employees on the latest building science strategies and innovations. By recognizing employees for their hard work, Rockweiler remains committed to retaining the area’s top industry talent to best serve their customers.